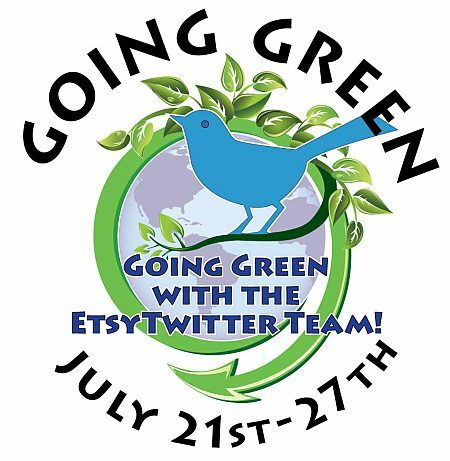 All week long my lovely team members from the Etsy Twitter Team have been showcasing their favorite eco-friendly items and it’s been a great motivation for me to think about what I’m currently doing & what else I could be doing to be more environmentally friendly with my work. Check out the green shopping guide Jen posted for more awesome shops. The biggest thing I’m currently doing to go green is my packaging – all of my mailers are made from recycled materials & whenever I can, I also reuse boxes. I just shipped off a painting to a customer using an Amazon box. It makes no sense to me to toss a perfectly good box into the recycling bin just because it had books sitting in it for 5 days! 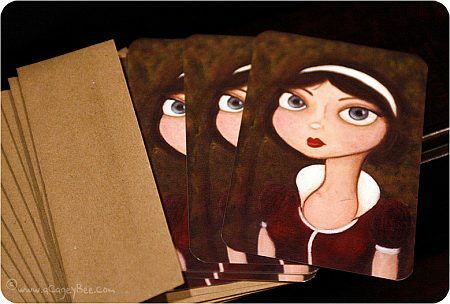 When I was shopping for envelopes for my postcard packs, I also went with the ones that had the highest percentage of post-consumer waste and found these beautiful brown paper bag envelopes made from 100% recycled material. I love their soft smooth feel & earthy tone. They tend to be a little more expensive than the bleached white standard envelopes manufactured in China, but I think they’re worth it. When it comes to the paper I print on & the ink I use for prints of my artwork, I need to focus on the best quality products for archival purposes. I want my prints to last a lifetime without fading or yellowing & unfortunately there aren’t a whole lot of green options yet. There is a local Vancouver company that prints using soy inks that I’m interested in trying out, at least for my postcards, business cards & other printed materials that don’t need to be archival quality. But what about those plastic bags that every print is sealed in? Up until literally *this week* I’ve been using the standard crystal clear archival art bags that seal up to prevent dust & fingerprints (particularly important at craft shows!). For storing prints for months (or years) at a time, they’re still the way to go, but for selling my work? My customers pull the prints out of their bags & have them framed while the bag is tossed in the garbage. Definitely an area that needs improvement in my process. After some searching for alternatives, I’m thrilled to announce that all new prints are going to be bagged in biodegradable bags! They just arrived a few days ago & look almost identical, but the new bags are actually made from plants. They’re certified biodegradable & compost-able. Apparently the bags will biodegrades in 15 weeks at a commercial composting facility. 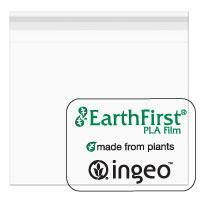 A plastic bag that can go in the compost pile? Amazing! 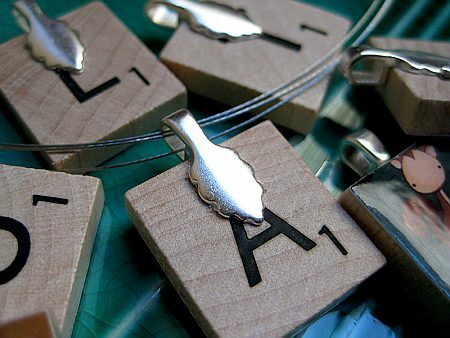 Last but not least, my Scrabble tile pendants also fall into the green category. I hit the thrift shops regularly looking for old Scrabble games & regularly find ones that are missing a bunch of tiles. No one wants to buy them to play the game if they’re not complete, so I’m able to upcycle the tiles and give them a new life. I use the boxes for storage & the little racks for displaying my pendants at craft shows. I just need to figure out something cool to do with my stack of Scrabble boards & I’ll be set! What are you doing to go green? I’d love to hear your tips & suggestions! Pingback: A Cagey Bee » Blog Archive » Ahhhhhhhhh!